Reader in the Real-Time Systems Research Group, University of York, UK. 25th IEEE Real-Time and Embedded Technology and Applications Symposium (RTAS 2019) Montreal, Canada, 16-18th April 2019. 31st Euromicro Conference on Real-Time Systems (ECRTS 2019) Stuttgart, Germany, 9-12th July 2019. 25th IEEE International Conference on Embedded and Real-Time Computing Systems and Applications(RTCSA 2019) Hangzhou, China, 18-21st August 2019. Submission deadline (extended) 25th April, 2019. 27th International Conference on Real-Time Networks and Systems (RTNS 2019) Toulouse, France, 6-8th Nov 2019. Submission deadline 30th April, 2019. 40th IEEE Real-Time Systems Symposium (RTSS 2019) Hong Kong, China, 3rd-6th December 2019. Submission deadline 30th May, 2019. Full list of publications. Publications by topic. Publications by venue. Further information can also be found via Google Scholar, Semantic Scholar, DBLP, and also in York Research Database. [TR] tech report C. Maiza, H. Rihani, J.M. Rivas, J. Goossens, S. Altmeyer, R.I. Davis, "A Survey of Timing Verification Techniques for Multi-Core Real-Time Systems”. Technical report: Verimag Research Report,TR-2018-9, 2018.
 chapter D. Maxim, L. Cucu-Grosjean, R.I. Davis, "Probabilistic Analysis”. In Handbook of Real-Time Computing, Springer 2019.
 workshop J. Harbin, D. Griffin, A. Burns, I. Bate, R.I. Davis and L.S. Indrusiak, "Supporting Critical Modes in AirTight”. In Proceedings Workshop on Mixed Criticality (WMC 2018), 11th Dec 2018.
 conference A. Burns, J. Harbin, L.S. Indrusiak, I. Bate, R.I. Davis and D. Griffin, "AirTight: A Resilient Wireless Communication Protocol for Mixed-Criticality Systems”. In proceedings 24th International Conference on Embedded and Real-Time Computing Systems and Applications (RTCSA 2018) 28-31st August 2018. (Presentation). conference R.I. Davis, I. Bate, G. Bernat, I. Broster, A.Burns, A. Colin, S. Hutchesson and N. Tracey, "Transferring Real-Time Systems Research into Industrial Practice: Four Impact Case Studies ”. In proceedings 30th Euromicro Conference on Real-Time Systems (ECRTS 2018) 3rd-6th July 2018. (Presentation). workshop R.I. Davis, S. Altmeyer, A. Burns,"Priority Assignment in Fixed Priority Pre-emptive Systems with Varying Context Switch Costs”. In Proceedings Real-Time Scheduling Open Problems Seminar(RTSOPS 2018), 3rd July 2018. (Presentation). journal A. Burns, R. I. Davis, S. Baruah, I. Bate, "Robust Mixed-Criticality Systems”. IEEE Transactions on Computers, pages 1-12, Early access 2nd May 2018.
 journal R. I. Davis, S. Altmeyer, J. Reineke, "Response-time analysis for fixed-priority systems with a write-back cache”. Real-Time Systems, pages 1-52, first online 11th Apr 2018.
 conference R.I. Davis, S. Altmeyer, A. Burns, "Mixed Criticality Systems with Varying Context Switch Costs ”. In proceedings IEEE Real Time and Embedded Technology and Applications Symposium (RTAS 2018) 11-13th Apr 2018. (Presentation). conference M. Nasri, R.I. Davis, B. Brandenburg, "FIFO with Offsets: High Schedulability with Low Overheads ”. In proceedings IEEE Real Time and Embedded Technology and Applications Symposium (RTAS 2018) 11-13th Apr 2018. (Presentation). journal T. Feld, A. Biondi, R.I. Davis, G. Buttazzo, F.Slomka "A Survey of Schedulability Analysis Techniques for Rate-Dependent Tasks”. Journal of Systems and Software, pages 100-107, April 2018 (Online Dec 2017). This is the author’s version of the work. It is posted here for your personal use. Not for redistribution. The definitive version is available at Journal of Systems and Software. workshop A. Burns and R.I. Davis,"Response Time Analysis for Mixed Criticality Systems with Arbitrary Deadlines”. In Proceedings Workshop on Mixed Criticality (WMC 2017), 5th Dec 2017. (Presentation). journal R. I. Davis, A. Thekkilakattil, O. Gettings, R. Dobrin, S. Punnekkat, J-J Chen, "Exact Speedup Factors and Sub-Optimality for Non-Preemptive Scheduling”. Real-Time Systems, pages 1-39, first online 28th Oct 2017.
 journal A. Burns, R.I. Davis, "A Survey of Research into Mixed Criticality Systems." © ACM, (2017). ACM Computing Surveys, 50, 6, Article 82 (December 2017), 35 pages. DOI=10.1145/3131347 This is the author’s version of the work. It is posted here by permission of ACM for your personal use. Not for redistribution. The definitive version is available at ACM Computing Surveys. journal B. Lesage, D. Griffin, S. Altmeyer, L. Cucu-Grosjean, R. I. Davis, "On The Analysis Of Random Replacement Caches Using Static Probabilistic Timing Methods For Multi-path Programs” Real-Time Systems. pages 1-82. First online 18th Dec 2017.
 conference S.A. Rashid, G. Nelissen, S. Altmeyer, R.I. Davis, E. Tovar, "Integrated Analysis of Cache Related Preemption Delays and Cache Persistence Reload Overheads”. In proceedings IEEE Real Time Systems Symposium (RTSS 2017) 6-8th Dec 2017. "On the Meaning of pWCET Distributions and their use in Schedulability Analysis” at the Real-Time Scheduling Open Problems Seminar, Dubrovnik, Croatia, 27th June 2017. (Presentation). "On the Evaluation of Schedulability Tests for Real-Time Scheduling Algorithms ” at the 7th International Workshop on Analysis Tools and Methodologies for Embedded and Real-time Systems (WATERS), Toulouse, France, 5th July 2016. (Presentation). "Real-Time Scheduling and Automotive Networks" at the 2nd Critical Embedded Systems Chair(CESEC) Summer School, at ENSEEIHT, Toulouse, France, 8th - 12th Sept 2014. (Presentation). 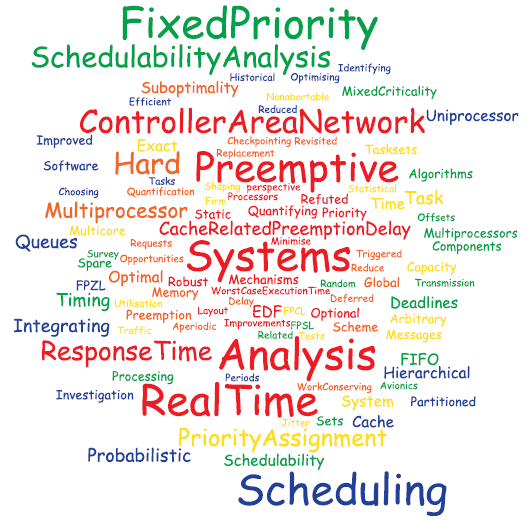 "A Review of Fixed Priority and EDF Scheduling for Hard Real-Time Uniprocessor Systems" at the Summer School on Real-Time, (L’École d’Été Temps Réel 2013), 26th - 27th Aug 2013. (Presentation). impact Impact Case Study White Paper: How long does your real-time software take to run? More about the Impact Case Studies. General Chair of the 40th IEEE Real-Time Systems Symposium (RTSS 2019) Hong Kong, China, 3rd-6th December 2019. Member of the steering committee for the Real-Time Scheduling Open Problems Seminar (RTSOPS) . Member of the steering committee for the Workshop on Mixed Criticality systems (WMC) . Member of the steering committee for the International Conference on Real-Time Networks and Systems (RTNS). Member of the executive committee of the IEEE Technical Committee on Real Time Systems (TCRTS), 2016 and 2017. Associate Editor of Springer journal Real-Time Systems. Co-organiser of Dagstuhl Seminars on Mixed Criticality Systems. Robert received a DPhil in Computer Science from the University of York in 1995. Since then he has founded three start-up companies, all of which have succeeded in transferring real-time systems research into commercial product. In 2002, Robert returned to research at the University of York, initially working in the Advanced Computer Architectures Group on AURA pattern matching technology. Robert was responsible for developing a new version of the AURA library, achieving a 3-fold improvement in both search times and memory requirement. Today the AURA library is used extensively in research and also in a number of products marketed by Cybula Ltd. In 2004, Robert re-joined the Real-Time Systems Research Group, where he was involved in setting up Rapita Systems Ltd., a spin out company, aimed at transferring worst-case execution time analysis technology into industry. Today this technology is used by leading Avionics, Space and Telecommunications companies. (See the RapiTime Impact Case Study White Paper). 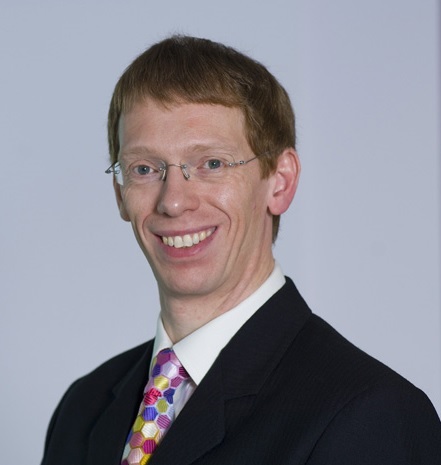 In 2010, Robert returned to full-time research at the University of York. Location: Office CSE/139, Department of Computer Science, University of York, Deramore Lane, York, YO10 5GH.